With an acting career bridging six decades, George Takei is known internationally for his role in the hailed “Star Trek” television and movie enterprise as Hikaru Sulu, helmsman of the Starship Enterprise. After spending his young years imprisoned in Japanese-American internment camps during World War II, he became one of the country’s leading figures in the fight for social justice, LGBTQ rights, and marriage equality. Mashable.com named Takei the No. 1 most-influential person on Facebook. 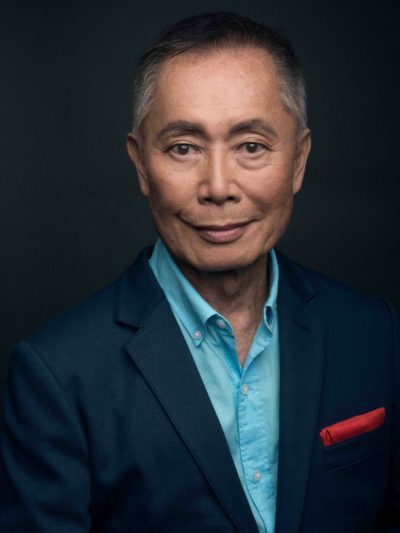 Takei hosts the AARP-produced YouTube series “Takei’s Take,” and is the subject of “To Be Takei.” Takei and his husband Brad Takei bring viewers into their personal life in the heightened reality web series, “It Takeis Two,” on YouTube. Takei made his Broadway debut with the musical, “Allegiance,” in San Diego, which ran in New York 2015-16. Coming back to San Diego, Takei premiered the short film “American” at the San Diego GI Film Festival at the Museum of Photographic Arts on Sept. 25. Openly gay, Takei is a fervent advocate for social justice, human right issues, equality for all and a community activist. How did you get involved with “American” and why did you choose to play the role? It started with a call from Richie Adams [writer and director], and the more he talked, the more excited I got. First of all, the internment of Japanese-Americans and the heroism of the young men that were taken from barbed wire imprisonment who fought with such incredible, amazing valor and heroism — the telling of their story is very important to me. As many people know, my mission in life is to try and raise awareness of that chapter of American history, the imprisonment of Japanese-Americans. Because of the inability of this country to draw the distinction between the Japan that bombed us and American citizens of Japanese descent, they [the government] thought we were the same as them. I grew up from 5 to 8 1/2 years old in three of those camps, transferring from one to the other. He [Adams] told me that the executive producer of this project, Ken Whitney, was married to a Japanese-American woman. Her mother was my father’s secretary in the Arkansas camp that we were imprisoned at. My father was a block manager. Each block had a block manager who was the liaison between the camp command and also [dealt] with whatever issues came up within the block. I remember that. She was a young teenager then. I went to my father’s office and she was tapping away at this amazing machine [he laughed, a typewriter] — I was 5 [years old] and had never seen that. It fascinated me. That woman is the mother of Whitney’s wife. One of the cast members, in typical Hollywood fashion, is the daughter of the executive producer. That family connection intrigued me. He [Adams] sent me the script, some other reading material for the short film, and the story of heroism of those young men who were drafted out of those barbed wire prison camps is an important story. It’s really a small world and a world of not coincidences, but I think this was all meant to be. In San Diego, I did another passion project of mine, “Allegiance,” a musical at The Old Globe Theater. It was the biggest box office success in Old Globe history. I love San Diego because of all of these wonderful things that have happened in connection with San Diego. These projects, that happened in almost a pre-ordained way, is something in life that I believe that some force is controlling our lives. That’s how “American” came to me. Where you able to contribute to the creative process in this film? I shared a lot the information that I have gathered in my life. I’m 81 years old now. I learned a lot about the internment from my father primarily. Many Japanese-Americans did not talk about this history with their children because it was painful — they felt degraded by it and didn’t want to inflict their children with it. Particularly, after “Allegiance,” people would come backstage and tell me that their parents or grandparents had been in the internment camps. When I asked them, “Which one were they in?” their faces were blank. “Were they in Wyoming, Arkansas, Arizona, Idaho?” I questioned them. They knew nothing about the camps because their parents had never talked to them about it. One person told me their father was a soldier in WWII and I asked if he was with the 442nd [Infantry Regiment, best known for its history as a fighting unit composed almost entirely of second-generation soldiers of Japanese ancestry who fought in WWII], and she said, “I think he was with the Japanese army.” They were so ashamed of the imprisonment that they wouldn’t even talk about their fighting with the U.S. Army. So I was able to share a lot of what I know, some of the details of camp with Richie Adams. Immediately after the bombing of Pearl Harbor, young Japanese-Americans, like many young Americans, rushed to the recruiting office to volunteer to serve in the U.S. military. This act of patriotism was answered with a slap in the face. They were denied to serve and were categorized as enemy aliens, which was outrageous. This was a patriotic act, and to call them enemies was crazy and absolutely insane. And equally insane was to call them aliens. They were born, raised, educated … they were Americans. That’s the kind of hysteria that Japanese-Americans were subjected to. At the age of 5, I was classified as an enemy alien too. But I was 100 percent non-alien. I was American. My mother was born in Sacramento and my father was a San Franciscan, and they married in Los Angeles, where I was born. And then, to take everything away from us, impoverish us, and imprison us for the duration of the war was crazy. A year into the war, there was a manpower shortage. They needed men. And all these people they insanely categorized as enemies and aliens tried to figure out how to justify how to recruit these people [to fight the war with Americans]. So they [government] came up with this loyalty questionnaire, demanding our loyalty, after they took everything away from us. That was outrageous. It was about 35 questions, but the most offensive one was question 28, which was one sentence with two conflicting ideas. It asked, “Will you swear your loyalty to the United States of America and forswear your loyalty to the emperor of Japan?” They thought we had an inborn racial loyalty to the emperor. It was insulting, it was galling. If you answered no, it also applied to the first part of the sentence. If you answered yes, it also applied to the second part of the sentence as an admittance of guilt that you had been loyal to the emperor but were now willing to forswear it. To underscore this incredibleness of the whole thing, these young men — and women too — bit the bullet, answered yes to the question and went on to serve the U.S. military. Women were put into WAC [Women’s Army Corps], and the men were placed in segregated groups and [were] literally used as cannon fire, sent out in waves, with an ironic way to say it, on these banzai charges. The movie is about a veteran of the 442nd [Infantry Regiment]. He saw his buddies die right next to him. The character I play is a veteran in his 90s who volunteers at the Japanese American National Museum. A museum which I am one of the founders of, [serving as] chairman of the board from 2000-2004. He volunteers as a docent to honor his buddies that died. This subject is so near and dear to me, I was impelled to do this film. With two films on opening night that deal with the role of Japanese-Americans during WWII, how important do you believe this is to document their roles in U.S. history? It’s crucially important now [to document this history] in these two years that we have been living through […] the same thing being repeated again. Donald Trump, immediately when he became president in February 2017, signed the first Muslim travel ban. Just like us, we looked like the people that bombed Pearl Harbor — it is the same broad-brushed mentality. All people of the Muslim faith are potential terrorists [to Trump] and I was so outraged. After he signed the first executive order of a complete and total ban of all Muslims coming into the country, thousands of young Americans rushed to the airports all over the country to protest, attorneys rushed to volunteer pro-bono their services for immigrants from the Middle East, and the Deputy Attorney of the U.S. Sally Yates refused to defend that first travel ban. The people of America had learned through the internment of Japanese-Americans, but that idiot in the White House had not learned, so he signed a second Muslim ban. Again attorney generals from around the country challenged that. He finally did another selective Muslim travel ban and the Supreme Court, just a few months ago, upheld that. But the irony there is that on the same day, they overturned the Korematsu [v. United States] decision of 1944 when the Supreme Court then upheld the internment of Japanese-Americans. Sometime in the future, a Supreme Court will be overturning this Muslim travel ban that this Supreme Court upheld. How do you believe “Americans” reflects our current border policies and camps conditions? Calling patriotic young men who are volunteering to fight for this country “enemy aliens” is absolutely crazy — we are going through it again. But this is worse. At least when we [Japanese-Americans] were interned, our families were intact. What’s happened with this administration is that infants and children are being torn away from their parents. It’s so malevolent; rather than keeping them with their parents, they are scattered all over the country. And with their [government officials] pathetic incompetence, they cannot find them again and put them back together. There are still around 500[children] that have not been reunited. I thought the lowest we [the U.S.] could get was when we [Japanese-Americans] were imprisoned, but the hysteria now — it is mean and cruel to take these children away from them. These lives have been ruined. During the film festival this year, there are two LGBTQ-themed films. Do you have a message for our LGBTQ active duty members, many who are struggling today, unsure of their military future? On a lesser scale, “don’t ask, don’t tell” was a battle we had to fight. It’s absurd. People who had served with great courage, heroism and honor [were] being kicked out simply because of their sexual orientation. It seems to me their service (LGBT’s in the military] with honor should qualify them to serve. In reverse, they were humiliated. And we are also in a stage now where women are fighting for equality like the LGBT community has struggled for. In many ways, the military has been at the spearhead at segregation from African-Americans, Japanese-Americans, and women. The struggle for equality is always ongoing. We have to be engaged. The same thing my father said, I’ve applied that to so many other things in my life. The LGBT community has been making advances. I was closeted until 2005. What brought me out was the work of other LGBT activists. What was really excruciating for me was the AIDS crisis, when friends were suddenly getting sick and drastically losing weight, getting hospitalized and visiting them as they looked like skeletons. To stay closeted at that time … but there were other bold LGBT activists who were in the arena sacrificing everything while I was trying to protect my career. I needed my career and couldn’t be out. And because of their activism, we started moving forward. In 2005, something extraordinary happened here in California. The state legislature, both the Senate and the Assembly, passed the marriage equality bill. It was the first time in the U.S. that a state passed a marriage equality bill. Massachusetts had marriage equality in 2003, but that came through its state Supreme Court. In California, it was the people’s representatives that passed marriage equality. That bill, in order to become law, needed just one more signature. The governor of the state of California. The governor at that time happened to be a movie star, Arnold Schwarzenegger. When he campaigned for the governor’s office, he campaigned by saying, “I’m from Hollywood. I’ve worked with gays and lesbians, so my friends are gays and lesbians.” With a campaign like that, I thought surely after the state legislature had passed it, Schwarzenegger would be compelled to sign it. He vetoed it. We have fallible human beings that still get elected, as we well know from the noises coming from the White House. We had that kind of irrationality, that fear at our governor’s office. That irrationality, that fear, got me so angry. I was together with [now-husband] Brad at that time — we had been together for more than two decades — so my blood was boiling. That’s when I came out. And I blasted Arnold Schwarzenegger for that and that is when I became “active,” as my father would have said. He was gone by that time. I joined the Human Rights Campaign, went on a nationwide speaking tour, went to Washington D.C. to lobby Congress, and became my father’s son. When I was a teenager and started questioning my father about the internment, how unjust it was, some of those after-dinner conversations got pretty heated. I was an idealistic teenager and in one conversation I said, “Daddy, you led us like sheep to the slaughter when you took us into those barbed wired camps.” Suddenly, the subject stopped. I immediately realized I had gone too far. I still remember the silence. He said, “Well, maybe you’re right.” Then he got up, went into his bedroom, and closed the door. I felt terrible. I felt like knocking on the door and apologizing, but since he shut the door, I thought I’d wait until morning. But when morning came, it was even more awkward, and I never apologized to him. But I learned so much about his anguish as a teenager during those after-dinner conversations. He pointed to the ideals that we learn in the history books, “All men are created equal, endowed with unalienable rights to life, liberty and the pursuit of happiness.” It took great people to articulate that and it took great people to keep that ideal going throughout the history of this country. One Sunday afternoon, he drove me downtown [Los Angeles] to the “Adlai Stevenson for President” campaign headquarters. He said we volunteered, but he volunteered me. There, I learned what makes our ideals work. You have to be actively engaged. I’ve been a political activist since then. I owe it to my father’s incredible wisdom.